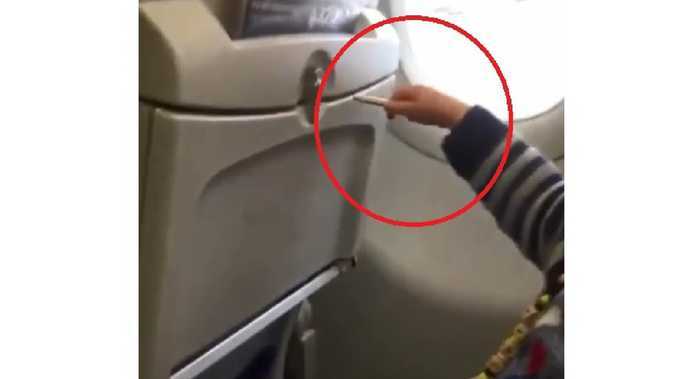 The short clip, which was shared on Reddit and on the Passenger Shaming Instagram account, shows a young child seated on an adult's lap scribbling on the table. At one point, the child removes the pencil from the tray - only for the adult to grab their hand and direct it back to the table. The Instagram account, which posted the video with the caption: "Not only are tray tables for changing sh*tty diapers on, now you can help your kids draw all over them! It's only a $100M aircraft. NBD. #parentingfail", has received an outpouring of outraged comments. The act was variously described as "disrespectful", "rude" and "disgusting" by shocked social media users. Instagram user @sarahpulvere wrote: "I would never allow my kids to do that because it's disrespectful & rude. Pencils are for paper in my house, not walls or seats or floors or anything else. No doubt they're an a***hole as they're encouraging the kid to do it … I'm disgusted by this." "I would've said something to the adult if I'd seen this … on sheer principle. Disgusting," @vari_gia wrote, while @seemeslimjen added: "Pretty much all of the obnoxious behaviours of crappy passengers on this account are infuriating for one reason: they show how *entitled* some people are." However, it's just the latest shocking incident to occur on a plane in recent months. The incident, which was photographed and shared o the same Instagram account, showed the mother crouching with the toddler as the child relieved themselves. When airline staff told the woman to use the toilets instead, she allegedly berated them, saying: "I don't give a s***."